Dr. Miller is a physical therapist, ABSPT certified Geriatrics Clinical Specialist. Dr. Miller graduated from Wisconsin State Univ-Stevens Point with a B.S. in physical education/dance. She earned her post-graduate credential in physical therapy from the U.S. Army Medical Field Service School, her Masters Degree in Gerontology from University of Arkansas at Little Rock, and her PhD in Higher, Professional, and Adult Education from University of Southern California. Dr. Miller has worked in multiple areas of physical therapy to include: military hospital clinics, Veterans Administration Hospital, home health, acute hospitals, outpatient clinics, inpatient and outpatient rehabilitation centers. Her practice has been in the states of Texas, New Mexico, Alabama, Arkansas, Hawaii, and California. 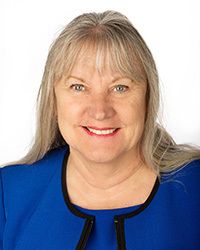 She has served the profession as an elected officer in several states and the national Section on Geriatrics, as well as on several State, regional, and national committees and advisory groups of the American Physical Therapy Association. Her contributions in physical therapy education include: establishment of a Physical Therapist Assistant program, design of PBL hybrid graduate PT curriculum, faculty at Univ. of Central Arkansas, Univ. of Hawaii-Kapi’olani CC, and CSU, Fresno. She has been Academic Coordinator of Clinical Education for both PT & PTA programs. She is also an APTA Certified Clinical Instructor. She has been a reader consultant, site visitor and team leader for PTA programs for the Commission on Accreditation for Physical Therapy Education [CAPTE]; and a content team member for Western Association of Schools and Colleges [WASC]. Dr. Miller has been a guest lecturer in programs other than physical therapy to include: higher education, public health, public administration, social work, psychology, athletic training and kinesiology; as well as career interest programs such as HCOP. She has administered an undergraduate interdisciplinary major leading to graduate study in health professions. She has been a program director for a PTA program and presented at national and international conferences. She has been a speaker and consultant for international programs as well as her domestic work. Dr. Miller pursues multiple research interests in Geriatrics, and CAM [complimentary and alternative medicine], specifically Rolfing/Structural Integration and Frequency Specific Microcurrent [FSM]. She has contributed chapters in four books and has published journal articles. She serves on request as a manuscript reviewer for Physical Therapy/Occupational Therapy in Geriatrics and Scientific Journals International. Her clinical practices are in Adult Day Health, SNF and CAM. At the University of St. Augustine for Health Sciences San Diego, Dr. Miller is an instructor for the entry level courses in the DPT: Skills & Procedures, Geriatrics, Research I, II, III, and developed a residency in Geriatrics. She is active in in the APTA and member of multiple sections. She has been an APTA Mentor and in the Educators Consultant Network.